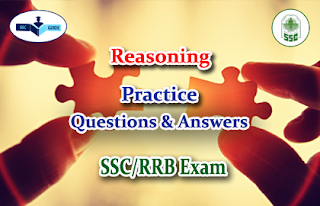 Dear Readers, Important Practice Reasoning Questions for SSC/RRB Exam was given here, candidates those who are preparing for those exams can use this material. 1).In a certain code, DEAF is written as 3587 and FILE is written as 7465. How is IDEAL written in that code? 2). If in a certain language, MADRAS is coded as NBESBT, how is BOMBAY coded in that language? Direction(Q. 3 – 6) : Select the related letter / word / number from the given alternatives. 3).Radio : Marconi : : Television : ? 4).SNHW : UOJX : : DPLT : ? 5).121 : 12 : 25 : ? Directions(Q. 9 – 10) : A series is given with one / two term missing. Choose the correct alternative from the given ones that will complete the series. 9).2, 7, 27, 107, 427, ? 10).24, 60, 120, 210, ?